The best analogy of how a computer system works is the human body. It provides inspiration to the design of all machines and today's modern PCs are no different. If the power supply unit is the heart of your computer, then the nervous system of a computer is the motherboard. 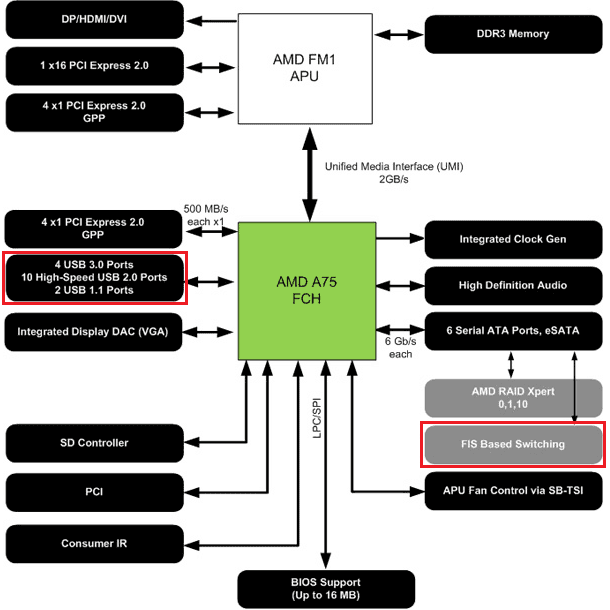 Earlier on, we took an in depth look at AMD's APUs (A8-3850/A6-3650) and the new Llano platform. Today, we are going to give you a closer look at the options for the "nervous system" we spoke of: The GIGABYTE A75M-UD2H. But is it the right nervous system for your AMD Fusion based PC? Let's find out! Upon first glance of the features, the first thing I noticed was that the GIGABYTE A75M-UD2H included one of each display option. It had HDMI, DisplayPort, DVI-D, and VGA. The VGA (D-sub) is actually linked to the A75 Hudson FCH through a “DP” link. This is because the output of the APU 0n-die northbridge is digital and the A75 Hudson FCH has a DAC (digital to analog converter). The GIGABYTE A75M-UD2H uses the A75 Hudson and has 2 advantages over its closest brother, the A55 Hudson. These offer FIS-based Switching and Native USB 3.0 support for up to four ports. FIS-based Switching is a built-in SATA port multiplier which allows for simultaneous communications across attached drives and multiple devices on a single port. I don't expect the latter to be used as 6 SATA III ports (5 headers and 1 on rear IO) is plenty for budget users. This difference is often the reason you need a RAID controller card to take full advantage of a RAID array. The A75 Hudson FCH on the GIGABYTE A75M-UD2H does not need a dedicated RAID card thanks to this feature. This potentially makes the A75 a unique option for something like a NAS or file server. The A75M-UD2H has several great features in addition to chipset features. Every USB port has 3x USB Power Boost to boaster performance of USB devices by preventing power dips. This is particularly useful for charging power hungry devices like the latest tablets. Each port also has its own fuse so in the unlikely event a USB port is blown, it will not affect the operation any other ports. The A75M-UD2H also supports boot drivers over 3TB, GIGABYTE's AutoGreen, On/Off Charge, and EasyTune6. It has dual BIOS with an automated recovery system. GIGABYTE does not skimp on quality either as the A75M-UD2H is an Ultra Durable 2 class board with 50,000 hours Japanese caps and lower RDS MOSFETS. This is a lot to pack into the GIGABYTE A75M-UD2H at an MSRP of $109.99 US. The price range for this motherboard is mid-ranged and the box contents are no different. You will find an Installation Guide, Motherboard Manual, and Driver DVD. The Motherboard Manual is well written, well laid out, and usually provides more than enough information for basic setup. It even includes a flow chart of the most likely causes to common issues encountered during an initial build. Also in the box is the back panel I/O shield, Dolby Theater case badget, and 4 SATA III cables (two with 90° angles and 2 flat). Some boards in this price range will come with only 2 SATA cables so the extra set are a bonus. The included driver DVD obviously includes all the drivers for your system, including a trial offer for Norton anti-virus software and Adobe Acrobat Reader. I am not sure why a DVD was needed, but I guess its just another sign CDs are dead. We wanted to see how the A75 platform compared to a more expensive platform in the AMD family. The GIGABYTE 890FXA-UD5 is a little over twice as expensive so it should help to determine if the price is a result of lower quality components or fewer components, and if the APU concept is a good one. To limit the number of variables, the A75 system and the Phenom II system are identical except for the processor. To ensure this does not skew the results I disabled two cores and down clocked the Phenom II X6 1100T to 2.9 GHz. This gives a slight edge to the A8-3850 in memory intensive tasks, but again we are testing the motherboards not the CPUs. This will give us the foundation to compare against other A75 boards in upcoming reviews.